Chemical Guys Citrus Wash & Gloss is a concentrated washing solution designed to help you clean the paint safely and add more shine to the surface. Mix one half ounce of the solution with 1 - 2 gallons of water when you want to wash your vehicle and not strip off the current layer of protection. If you want to use as a paintwork cleanser to strip off the current layer of protection mix 2 ounces with one gallon of water. The citrus formula helps safely separate and lift contaminants, suspending them in the foam solution. Unlike strong solvents and other harsh chemicals the active cleaning agent is a natural citrus extract, which is 100% biodegradable. The formula also has gloss enhancers that help add more shine to the surface after each wash. 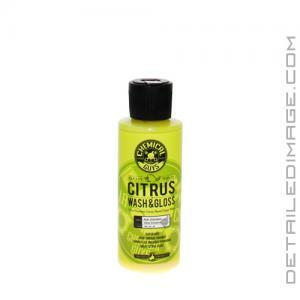 This versatile product is sure to be a great addition to any detailer's collection of products. Works great in foam guns and foam cannons too. Cleaned up deep grime off of a customer's white civic si very well! I love the smell, how concentrated it is, and how much of a gloss it left before I even applied a sealant. A+ job on this one Chemical Guys! Will buy again. Absolutely the best car wash I've ever used! I was told even though this is not PH balanced, it's still a relatively mild shampoo and the lubricity and shine afterwards is 2nd to none. I've used the melon and mr.pink and so far this will be my goto shampoo. It does seem to add some protection because my truck still looks clean after 1.5 weeks. The soap itself is very slick and my mitt glides right over my paint. A again from chemical guys!